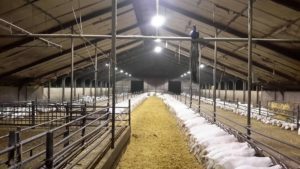 Agrilight b.v. has a unique understanding of lighting technology and the targeted use of lighting for different types of livestock. Light intensity, light distribution, day length and light colour all have implications for animal welfare and therefore animal behaviour. The correct balance between these four factors has a positive influence on the livestock. Correct, uniform lighting helps to improve health and productivity, amongst other things. 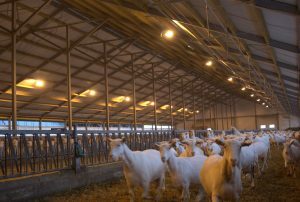 Lighting, particularly the lighting regime or day length, has a significant influence on the milk yield and fertility of goats. When it is dark, more melatonin is produced in the brain. This ‘sleep hormone’ plays an important role in the production of growth hormones and inhibition of the hormone insulin. When days are longer with more hours of light (summer-length days, 16 hours of light) production of the growth hormone increases and goats produce more milk. As the days grow shorter (autumn, with approximately 8 hours of light per day) the milk yield declines and fat formation and readiness for mating (heat) increase. • Less fertile animals remain productive. For drying off, the light in the house must be limited temporarily to 8 hours per day. To stimulate a lactation peak you should change the lighting regime from short to long days in addition to changing the feeding regime. Goats are naturally fertile and ready to mate (rutting/in heat) in the autumn. In does, the cycle and heat are influenced primarily by differences in day length, but also by temperature, presence of a buck, restlessness. You can bring some of your goats into heat earlier or outside the normal season by first maintaining a regime of 16 hours at 200 lux for a given period, and then artificially reducing the day length to 8 hours of light per day. This lighting programme for both does and bucks stimulates simultaneous, more obvious and longer rutting/heat and the production of more and higher-quality sperm. A sophisticated lighting programme also supports hormone treatment and artificial insemination, resulting in a higher percentage of successful pregnancies. Kidding outside the season leads to the production of (fat) winter milk and makes it possible to spread the workload more evenly (all year round). With the correct light level in the house you can identify any health problems in the animals at an earlier stage. Research has shown that the house must be dark for at least 4 hours per day (up to approx. 3 lux) if the lighting regime is to have a positive impact on the goats. When checking the animals at night, red lighting provides sufficient visibility and does not disturb the animals’ rest. An unsuitable light level or lighting regime may have implications for the health, performance and welfare of your livestock. 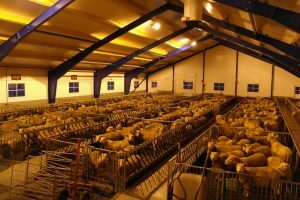 That’s why you should always seek advice before purchasing lighting for your livestock housing. We can draw up a free, no-obligation lighting plan that will set out all the benefits of a good, well-designed light level.